﻿ Kiev is the capital of Ukraine | Top facts about Kiev (Kyiv): Units Consulting Ltd. (Kiev, Ukraine). Kiev (Kyiv) is one of the more beautiful and one of the oldest cities of Eastern Europe and has played a pivotal role in the development of the East Slavic civilization as well as in the modern Ukrainian nation. 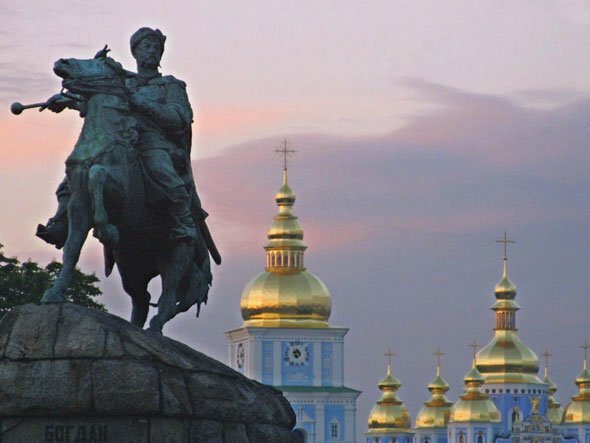 Founded 1500 years ago, Kiev is the capital of Ukraine and Kiev region. The name Kiev is said to derive from the name of Kiy (also Kyi), one of four legendary founders of the city (brothers Kiy, Shchek, Khoryv, and sister Lybid). They founded the city in the 5th century A.D. The legend is widely recognized as a source of Kiev's mythology and, accordingly, urban naming. Kiev is situated on the picturesque banks of the Dnieper river. It is one of the most beautiful cities of Europe. One half of Kyiv's territory is occupied by parks and gardens. One of the biggest cities of Europe, Kiev has a population of 3,14 million and occupies an area of more than 840 square kilometres. Kiev's most famous historical architecture complexes are the St. Sophia Cathedral, where the princes of Kiev were crowned in the years of Kiev's grandeur, and the Kiev Pechersk Lavra (Monastery of the Caves), has two 11th-century cathedrals on its grounds, in addition to its world-famous catacombs, which are recognized by UNESCO as a World Heritage Site. Also of interest are the ruins of the 11th-century Golden Gate, once the main entrance to the city. Kiev is the site of several universities, most notably the University of Kiev (founded in 1834). The Ukrainian Academy of Sciences and its Central Library, Ukraine’s largest library, are located in Kiev. Kiev is a modern city with many monuments, more than 100 museums (including the National Museum of the History of Ukraine (1899), the National Museum of Natural History, the National Art Museum of Ukraine, Pirogovo), 33 theatres (including a Music Conservatory, National Opera of Ukraine), zoo and a large sports stadium. Kiev is served by a good transportation network. Trunk railways and all-weather roads link Kiev to Moscow, Kharkiv and the Donets Basin, southern and western Ukraine, and Poland. Within Kiev city itself there is efficient subway, rail, and bus service. The Dnieper River is navigable about nine months of the year, and Kiev’s Boryspil airport operates flights to other Ukrainian cities and to cities in Europe, Asia, and North America. Archeological excavations show evidence of the first settlements on the territory of Kiev 15,000 to 20,000 years ago. Kiev was the first ever capital of Kievan Rus', the first Russian state (late 9th century - 1240). It was built on the lands of the Polyan tribal union, but it later incorporated all the Eastern Slavic tribes. In 988 Prince Vladimir introduced Christianity to Kievan Rus. From Kiev began the Russian Christianity and the Orthodox culture. Kiev known to Russians as the "mother of Russian cities". Kiev was the largest town in XI century Europe, fifty times the size of London, ten times the size of Paris. It reached the height of its prominence under the rule of Yaroslav the Wise (1010-1054 AD), who had family connections to the royal houses of France, Norway, Hungary, and Poland. At the end of the 15th century Kiev was the Magdeburg law. Administratively, the city is divided into "raions" ("districts"), which have their own locally elected governments with jurisdiction over a limited scope of affairs. Presently, there are 10 raions. Kiev's unofficial logo is chestnut. May is the most beautiful month in Kiev when chestnuts bloom. Kiev will play a leading role in hosting the Euro 2012 Football Championships. The standard time in Kiev is 2 hours later than GMT/UTC (Daylight Savings Time: EEST (UTC+3). Kiev is the capital of Ukraine, interesting facts about Kiev (Kyiv), information about Kiev, company registration & formation in Kiev.